Recently I came across some good news out of Japan: their wind farms are still working, despite the calamities that nation has faced in the past week. As I previously noted, wind power is picking up speed as a viable green energy source. The news out of Japan gives wind power another “feather in its cap”. According to Yoshinori Ueda, leader of the International Committee of the Japan Wind Power Association & Japan Wind Energy Association, there has been no wind facility damage reported by any association members, from either the earthquake or the tsunami. Even the Kamisu semi-offshore wind farm, located about 300km from the epicenter of the quake, survived. To read more about how the Japanese wind farms survived, read the full story from Kelly Rigg, HuffPost writer. Ms. Riggs is also Executive Director of the Global Cool Cities Alliance (GCCA), which has a very interesting website which explains the science behind reducing Heat Island effects in cities through the use of light-colored, reflective roofs. 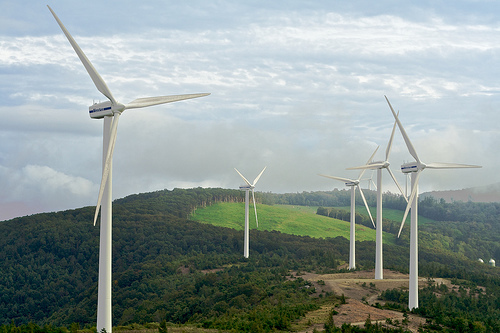 Photo: A wind farm in Kuzumaki, Iwate, Japan via jasohill.